Need some spring inspiration? 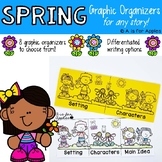 All the following are spring themed : 2 main idea worksheets, story map, sequencing sheet, writing planning page, writing paper (2 sizes of lines) and a journal cover! Have questions, just ask! This Common Core aligned lesson plan for kindergartens, first graders, or second graders on research and writing through graphic organizers is best used as a literacy center. Each month is themed and it is for the second semester. There are five choices of topics for each month, January-June. 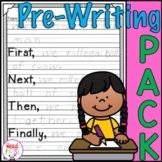 This pack includes two different writing prompts that go along with the informational text book "An Egg is Quiet" by Dianna Hutts Aston. Great to go along with a spring egg unit. Thanks for looking. Please consider leaving feedback. :-) Thank you! 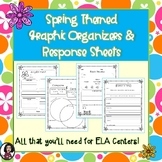 Also included in: Graphic Organizers & Literacy Center Recording Sheets BUNDLE!! I use this quick organizer for my emergency sub tub. It can be used for reading any spring story. Or for story planning in writing. 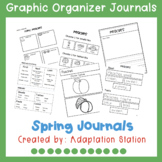 Your students will enjoy this quick activity to journal about their spring break. Let them write and draw freely or give them specific instructions on what to include. Have them add color and your students will have a nice keepsake of their vacation! Spring- Can/Has/Is Graphic Organizer helps getting the ideas flowing! Use this graphic organizer to get your ideas and thoughts together before you begin to write. Spring is here! Have students take a nature walk and use their senses to describe what they see, hear, smell, and feel. 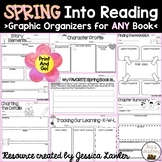 This graphic organizer can be used to brainstorm ideas for spring poetry or other creative writing activities.